This month we’re starting with Alexander McCall Smith’s No. 1 Ladies’ Detective Agency, yet another book I haven’t read but I know it’s set in Botswana and that’s its author was born in Zimbabwe (then Rhodesia). As was Petina Gappah, author of The Book of Memory in which a young black albino woman tells her story from the prison in which she’s detained for a brutal murder she insists she didn’t commit. Randal Keynes’ Annie’s Box is the story of Charles Darwin’s eldest daughter who died aged ten. The eponymous box contains keepsakes from Annie’s short life, shedding light on Darwin, his work and his family. Elizabeth Gilbert’s first novel, The Signature of All Things, tells the story of Alma Whittaker, a botanist, and her relationship with Alfred Russel Wallace who published a paper on evolutionary theory with Darwin in 1858. While Whittaker was a figment of Gilbert’s imagination, Wallace was not, although his achievement has been eclipsed by Darwin’s reputation. Gilbert wrote a book about her struggle to accept the idea of marriage despite being deeply in love with her partner. 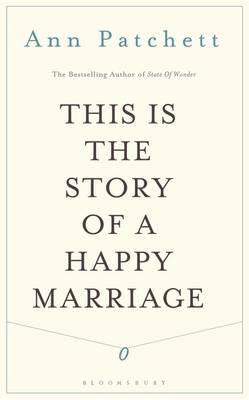 Ann Patchett wrote of a similar experience in This is the Story of a Happy Marriage which is very much more than that. It’s made up of a set of essays, an album of vivid snapshots of Patchett’s life and how she sets about her work as well how she came to finally marry. Patchett wrote what you might call an eco-novel, State of Wonder, set largely in the Amazonian rainforest. Barbara Kingsolver’s Prodigal Summer could also fall into that bracket. It follows a park ranger, a recently widowed entomologist and an old man hoping to find a way to bring an extinct American Chestnut tree back to life. Not one of her best for me – I preferred The Bean Trees and Pigs in Heaven – but worth a read. This month’s Six Degrees of Separation has taken me from a Zimbabwean prison to small-town Appalachia. Part of the fun of this meme is comparing the very different routes other bloggers take from each month’s starting point. If you’re interested, you can follow it on Twitter with the hashtag #6Degrees, check out the links over at Kate’s blog or perhaps even join in. This entry was posted in Books Read (But Not Reviewed), Reviews, Six Degrees of Separation and tagged Alexander McCall Smith, Ann Patchett, Annie's Box, Barbara Kingsolver, Elizabeth Gilbert, Margaret Forster, Petina Gappah, Prodigal Summer, Randal Keynes, Six Degrees of Separation, The Book of Memory, The Memory Box, The No 1 Ladies Detective Agency, The Signature of All Things, This is the Story of a Happy Marriage on 6 January 2018 by Susan Osborne. I have something of a chequered relationship with Ann Patchett’s writing: I loved The Magician’s Assistant but couldn’t see what all the fuss was about with the Orange Prize-winning Bel Canto. I was a little wary of becoming too excited about Commonwealth, then, despite an engaging blurb and a particularly attractive cover, but it completely won me over. It’s the story of a family, one which increasingly extends itself as marriages multiply and children are born. It’s also about the stories families tell themselves and how those stories can become more public than we might wish them to be. In 1964 Fix Keating opens the door to a guest at his daughter’s christening party to be met by a face he barely recognises. It belongs to a district attorney, not someone that a policeman like himself would count as a friend. Clutching a bottle of gin, Bert Cousins walks through the door as if he’s been invited when all he’s doing is avoiding Sunday with his own family. Gin at a christening party turns it in to something else entirely, sparking drunken encounters that will change lives irrevocably. A few years later Bert has married Fix’s beautiful wife Beverly and moved from Los Angeles to Virginia. His four children spend their summers with their father: Calvin, who likes to steal his father’s gun and tuck it into his sock; Holly the sensible one; otherworldly Jeannette and troublesome Albie, kept quiet by ‘tic-tacs’ fed to him by his siblings. Together with Caroline, furious at her mother’s desertion, and Franny, whose christening party Bert gate-crashed, these six form a tribe allowed to run wild by Bert and Beverly who would far rather look the other way until tragedy changes everything. As the years pass connections become tenuous, then are renewed. Marriages are made, children are born and Franny meets one of her literary heroes, blocked and in need of inspiration. Patchett’s intricately constructed novel crisscrosses the years from Franny’s christening party to the present day, telling the stories of the Keatings and the Cousins but always returning to Franny, the novel’s linchpin. Patchett is an expert in show not tell: stories are told and re-told as family members share them with each other – sometimes with illuminating differences. As the family extends itself over a half-century, new characters make an appearance but Patchett never loses her focus on Franny. Points are made but never laboured – both Leon’s exploitation of Franny’s story and Bert and Beverly’s negligent parenting are crucial to the novel’s development but lightly drawn. There’s a vein of gentle wry humour running through the novel: the scene in a hotel lift when Franny is frantically trying to extract the drunken Leon’s room key from him is downright comedic. It’s all beautifully done, loose ends neatly stitched in. Pleasingly rounded characters, meticulously constructed structure and thoroughly absorbing storytelling – no need for wariness with this one whose ending completes a beautifully executed circle. This entry was posted in Reviews and tagged Ann Patchett, Bloomsbury Books, Commonwelth, Contemporary American fiction, Families in fiction on 5 October 2016 by Susan Osborne. I’m a huge Ann Patchett fan and when I spotted her memoir in Bloomsbury’s catalogue it seemed the next best thing to a new novel. When it arrived I was a little disappointed as it turns out to be a collection of essays rather than continuous prose but after gobbling them all down I’ve come to the conclusion that it’s a better form than straightforward linear autobiography. Together they offer an album of vivid snapshots of Patchett’s life and how she sets about her work. The introduction explains how Patchett used newspaper and magazine gigs to fund her fiction before earning enough from it to give up her day job, so to speak, although she chose not to do this having come to enjoy the discipline of the essay and the excitement of finding out about new things. As her stature grew she was able to get commissions which tied in nicely with research for her novels – trips to Italy to review opera for Bel Canto which resulted in an abiding passion, a boat trip up the Amazon for State of Wonder. As anyone who knows her fiction will tell you she writes extraordinarily well. Her essays are clear, often incisive and pull no punches, particularly when describing the sheer hard graft of writing when addressing prospective writers who want a magic formula in The Getaway Car. We learn a great deal about Patchett’s life – the pleasures and otherwise of a large extended family, how she found her dog Rose her most constant companion for sixteen years, the sadness of looking after a beloved grandmother afflicted with dementia, the excitement of helping to set up an independent bookshop and, of course, last but not least the long eponymous essay on how she overcame her reluctance to marry based on a family history chequered with divorce and embarked on a very happy marriage to her husband Karl. Vivid images leap out from some of these essays – the Ku Klux Klan marching down the street of the small Nashville town where she lived as a child, pushing her ancient beloved dog in a buggy because she can no longer walk, determinedly struggling through the most taxing part of the LAPD entry programme. There isn’t a dud essay in this collection and somehow it feels more honest as a reflection of a writer’s life than a straightforward autobiography written with the gloss of memory. If you’re a fan, it isn’t a novel but it’s surely the next best thing, and if you’re an aspiring writer it’s worth the cover price just to read the advice in The Getaway Car. This entry was posted in Reviews and tagged Ann Patchett, Bloomsbury Books, Essays, Memoir, This is the Story of a Happy Marriage on 11 November 2013 by Susan Osborne.